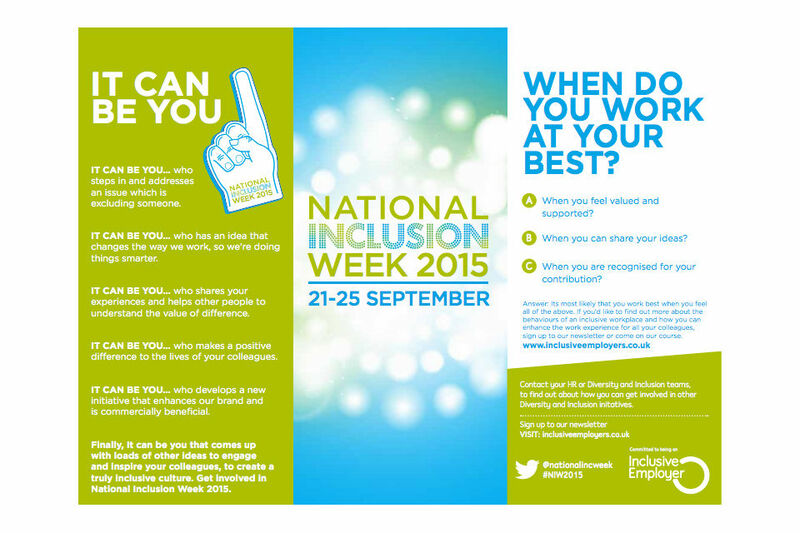 This Monday, for the first time, the Civil Service will be participating in National Inclusion Week. The week is organised and run by a group of private sector employer organisations. It is an annual campaign to raise awareness of the importance of inclusion in the workplace and the business benefits of having an inclusive workforce. We are proud to be supporting this week with a series of important announcements and events. The Civil Service is already one of the most inclusive employers in the country. we have introduced generous terms for Shared Parental Leave, we have started improving our talent pipelines so that there are more opportunities for staff from under-represented groups and we have introduced the new workplace Disability Passport to make life easier for those with adjustment needs. And thousands of civil servants have undertaken unconscious bias training, recognising that we all need to consider our behaviours to create an inclusive workplace. We have also launched Removing Barriers to Success - an ambitious two year programme to embed diversity and inclusion into all areas of the business. As part of this, next week we will be announcing the appointment of four new external D&I expert advisers. These advisers are hugely experienced and respected on D&I issues and will provide candid advice and challenge on all aspects of the Removing Barriers programme. We will also be publishing our Permanent Secretaries new diversity objectives setting out plainly what our most senior leaders want to achieve in their departments over the next twelve months. National Inclusion Week is all about participation, we want people to share stories with colleagues, sign up to events and challenge leaders when you think things could be done better. Most importantly, it is about making colleagues feel supported and valued so that they can feel comfortable being themselves at work. Many departments are holding events next week. Civil Service Live in Bristol will also be will also be supporting NIW. If want to get involved and organise something in your office you can find a range of materials here on the NIW website. We are supporting National Inclusion Week because it is vital that the Civil Service is representative of modern Britain. This is not just about fairness - organisations which are more diverse perform better, employees are more engaged and are far more productive. So take some time next week to read the experiences of others and consider whether your own behaviour could be more inclusive. Even though I lead the cross government D&I team there are things I could be better at, for example opening myself up to challenge particularly from those who have working styles different from my own. Please use comments below to share how you will mark the week or what a colleague has done to support and champion difference in your office.